Maca Group recognized as a one of Bali’s local group of villas are proudly announce that Maca Villas and Spa Bali as the winner of Bali Leading Villa of The Year and SOHAM Wellness Center as the winner of Bali Leading Wellness Retreat Resort. In addition, the Corporate General Manager Dr. © Yoga Iswara, BBA., BBM., MM., CHA recognized as one of Bali Top Hospitality Leader among other 17 top leader in Bali. These awards was awarded by Bali Tourism Awards during the 4th Bali Tourism Awards 2018/19 awarding night celebration on 27th August 2018 at Inaya Putri Bali Hotel, Nusa Dua. The Bali Tourism Awards are considered prestigious industry recognition as they recognize hospitality companies, travel, tourism companies, organizations and individuals who are raising the quality in terms of facilities, services and guest experiences. The nominees voted online and generated 52.332++ votes from 7 country and others. While a Board of Advisors and representatives from the BINUS Business School – a valued partner for the award founders the ITTA Foundation – make the final selections. 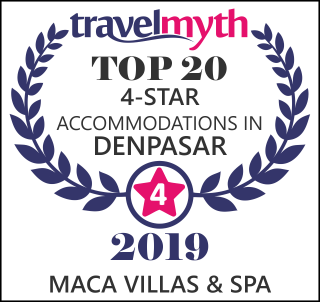 “Maca Villas & Spa Bali has received numbers of awards; nationally and internationally – while this is our first award for SOHAM Wellness Center. We are very proud to receive this recognition from the Bali Tourism Awards 2018/19. It is represent our resort towards our commitment which offering luxury service and facilities to every guests and member. It would not have been possible without the real effort, passion and dedication from our staffs”, remarked Corporate General Manager Dr. © Yoga Iswara, BBA., BBM., MM., CHA of Maca Group. SOHAM wellness Center is a wellness center that comes competes with modern fitness facilities, a spa, healthful café fare, and a lifestyle boutique. Soham Wellness Center is Bali’s best bet for staying in shape. A four-story building in the heart of Bali’s Seminyak neighborhood, the center features state-of-art gym equipment in a 2,000m2 indoor area, an outdoor Olympic-size swimming pool, a sauna and Jacuzzi and a dedicated cycle room. One-on-one sessions with nationally certified personal trainers are available, as are yoga, hot yoga, Pilate’s sessions, and other multiclass session alongside other inventive total-body and mind workout classes. SOHAM Wellness center is also completed with healthy cafe called Mase Green and lifestyle boutique. SOHAM truly is the most comprehensive wellness and lifestyle experience on the island. For more information please visit www.sohamwellnesscenter.com. Maca Group inspired by freshWater Asia. An Indonesian management company managing Maca Villas & Spa Bali, Maca Villas and Spa Umalas, SOHAM Wellness Center and Mase Group. Maca Villas & Spa Umalas, located in secluded area of Umalas, the north side of Seminyak area; set among tropical landscaped gardens, Maca Villas & Spa Umalas has seventeen - one and two bedroom pool villas and nine - two, three and four bedroom estates with Balinese and contemporary modern design. With a romance setting the One Bedroom pool villas are perfectly designed for couple. For more luxury and family escapes, the estates provide a generous sized of living and dining area with fully-equipped deluxe kitchenette and private garage. Maca Villas & Spa Umalas also completed with Mase Uma Kitchen and Bar, in villa spa and communal swimming pool to chill in. Mase Group is a group of restaurants, spreads among the properties of Maca Group. Mase Kitchen & Wine Bar – a charming fine dining restaurant with wide ranges of wine selection. It is completed the facility of Maca Villas & Spa Bali by serving International and Asian Fusion. Mase Uma Kitchen & Bar – a ‘FUN” concept restaurant with panoramic view in Maca Villas & Spa Umalas. A great place to escape from the daily routine or just to hang out with friends or family. Mase Green Café - serving carefully chosen fresh local and imported groceries in modern presentation, from inspirational low in calories and saturated dishes to delicious raw food selections, detox cold-pressed juice, and “guilt-free” light meal on the menu. Panoramic terrace near the pool of SOHAM Wellness Center, offers guest full relaxing experience.